In a newly published Apple patent application credited to Dale Setlak, co-founder of AuthenTec, the company reveals its interest in enhanced security capabilities for the iPhone home button and Touch ID. The patent application describes how the Touch ID sensor could be paired with an on-screen combination lock or other secondary security feature, requiring the user to move his or her finger in certain directions to fully unlock a device. 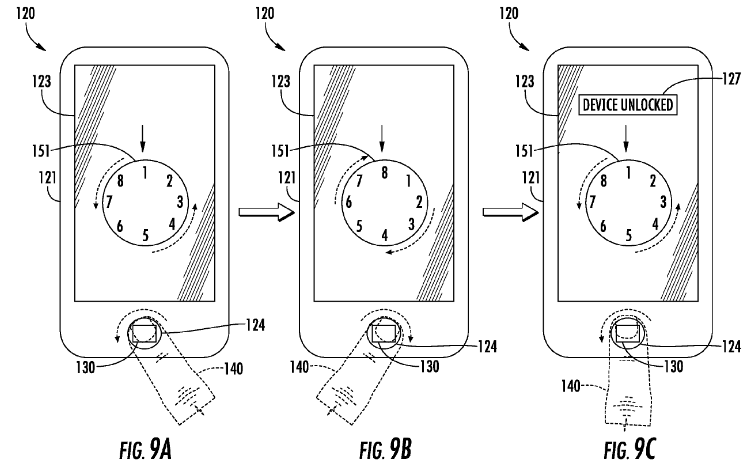 As noted by Patently Apple, the June 2013 application shows off a few possibilities for the new technology, including a traditional combination lock-style system that has the user rotating his or her finger on the Touch ID sensor to input a security code. Another potential implementation would require the user to swipe through a collection of circles by subtly shifting his or her finger in a specific pattern to unlock the phone. Both rely on the same technology created by AuthenTec that uses simultaneous security of a user's unique fingerprint and secure combinations to gain access to a device. AuthenTec has of course played an important role since its acquisition by Apple back in 2012, with the company's "Smart Sensor" technology serving as the basis for Touch ID. While Touch ID was implemented for security reasons, the addition of a simple-to-enter secondary security code would increase security even further as a form of two-factor authentication combining physical authentication (fingerprint) with knowledge-based authentication (lock combination or swipe pattern). Implementation of such a system would address concerns over court rulings indicating that users could be compelled by police to unlock fingerprint-protected devices, unlike with passcode-protected devices. The evolution of Touch ID from solely a fingerprint sensor in the iPhone 5s to the expanded "Reachability" features of the iPhone 6 and 6 Plus provides a hint at the possibilities of Touch ID in the future. And while inventions disclosed in Apple patent applications frequently do not ever appear in products, they can still offer some insight into Apple's areas of interest. No thank you. It's flakey enough as it is. Add this and it will never work. Yes it is the fault of the technology. Skin too dry? Too moist? It fails. It also fails dramatically in guided access mode. Not only doesn't it work to disable it, it actually resets the security so it thinks the phone was compromised. So you need your passcode to enable touched on everything again:login, apple pay, iTunes store, etc. That's what I mean by flakey. Show me any fingerprint sensor on the market today that will work reliably if you register your fingerprints with moist skin and then let your fingers crack/peel and then try to unlock with your print. It won't work -- and for good reason -- there is not a match. If there is not a match, it should not unlock the phone. Wanting it to work under such conditions is like wanting your car key to unlock another car because the grooves on the key to the other car are virtually identical to the grooves on your key. They might be almost identical but there is not a perfect match so it doesn't work. If it did work, that would be a far bigger problem. There are always going to be some instances where there are false negatives but I'd much prefer getting false negatives over getting false positives. To date, I haven't heard of anyone being able to hand their phone to someone and that other person being able to unlock the phone without first placing a copy of the owner's print over their finger. I've heard some folks say that after you've registered your print(s) with Touch ID, you can add additional readings of the print(s) by going into the Touch ID settings where it lists your print names and simply placing your finger(s) on the Touch ID sensor. Perhaps you may want to try doing this when your finger is dry to see if it is able to recognize enough of your print to match it and then train it with your "dry skin" print, as well. You'll know there's a match because the name of the print will light up when you place your finger on the Touch ID sensor. If none of the print names light up, there's no match. I spent an little bit of time doing this in the Touch ID settings placing my finger on the sensor every possible way I could think of that I would place my finger on the sensor -- sides, tip, etc. over and above what you do when you first register your print. My success rate with Touch ID has been near 100%. I hope the next couple years Apple integrates TouchID into the screen and the home button can slowly go away. It would be a huge change, but eventually phones will only be a screen. And then we go back to the home screen using our minds, right? I would love to be able to use it to scroll without blocking the content with my hand. I would be great for reading articles and books. Touch ID security is already very secure the was it is, it's great to see Apple being proactive about this. how I feel about the rotating finger, etc. I can say that for me touch id has worked flawlessly and I assume it would do the same for the rotating finger. The only time I had to use my password is when I restart the phone. I dislike that idea greatly. Seriously, the home button works.